Am I within distance for a 1-2-1 training session at home? We will travel whatever the distance to work with you and your dog. 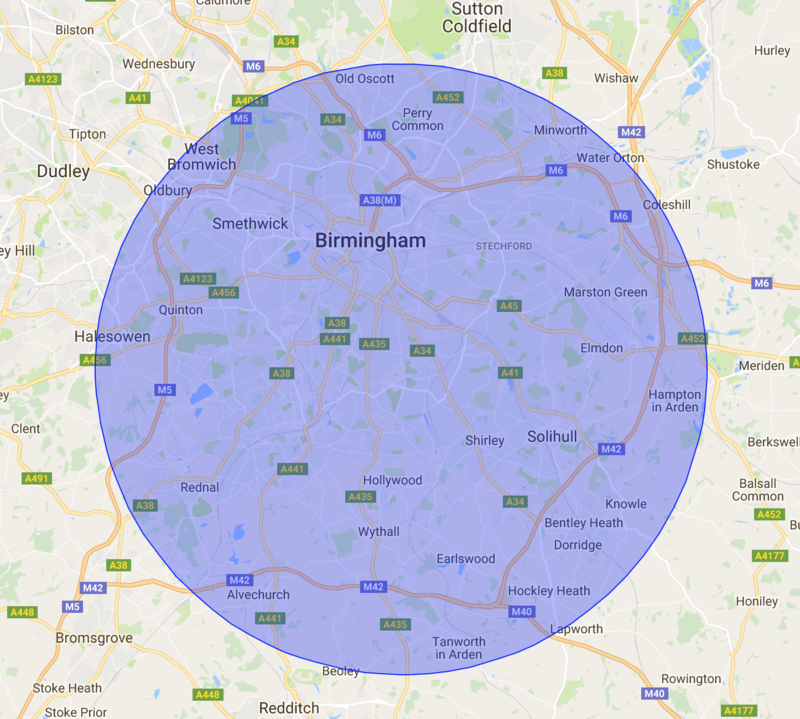 However if you are more than an hours drive from Birmingham, it may be better for us to spend more than 2 hours with you. Please give us a call on 07837 377273 for your individual quote. My dog barks at other dogs, can he come to training class? The most important thing at Pawfect Dogsense is that the dog and it’s owner is able to concentrate. If you’re worried about your dogs behaviour, it’s important to book a 1-2-1 with our behaviourist before you join a group training class. We are happy to train dogs with a variety of problems in our training classes, but if your dog is too fearful or distracted by other dogs it’s not the ideal training environment to start with. So we would always say, of course, reactive and barking dogs can come to training classes but we advise that you please book a 1-2-1 first. What training techniques do you use? Pawfect Dogsense may change these terms and conditions at any time by posting changes online. Please review these terms regularly to ensure you are aware of the latest changes. Your continued use of this site after changes are posted means you agree to be legally bound by the updated and/or amended terms and conditions. 2. “The Buyer” means the customer, person, business or company to whom goods/services are supplied subject to these conditions. 3. “The Goods” means any goods, services and accessories supplied by the Company to the buyer are subject to these conditions. 4. “The Contract” means any agreement for the purchase of goods/services by the buyer. 1. Payment must be paid at the point of booking, unless previously agreed with the company in writing. 2. If you can’t make a training session, please call the office on 07837 377273 to rearrange. If you cancel within 24 hours of an appointment then you will be charged 50% of the cost of the training session to cover loss of earnings. If you cancel a 1-2-1 within 60 minutes of the start time then you will loose your 1-2-1 and payment in full will be required for that session. 3. If a trainer arrives for a 1-2-1 and cannot gain entry or find the property, we will contact you via Email, Phone and Text for 20 minutes past your start time, at which point we will leave and your 1-2-1 booking will be cancelled and payment in full will be required. 4. Sessions booked in a block entitle you to consecutive weekly training, and gives you diary priority on booking. You have 2 cancellations but the Company must be made aware of cancellation no less than 48 hours prior to session. I.e If you block book 6 sessions, you have 8 weeks to use your sessions. Any sessions remaining after time period will be lost. Consecutive training sessions have proven more effective when dealing with behavioural and training issues than one-off sessions. 5. To minimise our carbon footprint, we will provide email receipts although paper copies are available on request. 6. Discounts and Promotions: Disabled Badge Holder’s and O.A.P’s may be eligible for discounts towards training costs, please call us to book rather than use the online booking system. 7. Due to the practicality of travelling during peak hours, please allow your trainer a 20 minute window around your allotted time. In the event your trainer is running late, you will be informed by phone or text. 8. Prepaid course payments and deposits are not refundable. 9. Any of our trainer’s have the right to withdraw training at any point. 1. The Company shall not be liable for failure to deliver the services for any reason whatsoever outside the reasonable control of the Company including, without limitation to the generality of the foregoing, industrial action, war, storm, fire, explosion, flood, govermental actions or regulations, act of god, riots, strikes, lock-outs, or non availability of stocks or materials. Any failure of this type shall not affect the obligation to pay for Goods already delivered. 1. All aspects of the Contract shall be governed by English law and the parties submit to the exclusive jurisdiction of the English courts. If we fail to enforce any provision of this contract, that failure will not prelude us from enforcing either that provision (or any similar provison) on a later occasion. You may not copy, reproduce, republish, download, post, broadcast, transmit or make available to the public any content from this site without the prior written permission of Pawfect Dogsense. This includes adapted, altered or derivative work. You agree to use this site only for lawful purposes, and in a way that does not infringe the rights of, restrict or inhibit anyone else’s use of the site. Prohibited behaviour includes harassing or causing distress or inconvenience to any person or transmitting obscene or offensive content. The content provided on this site including the information, names, images, pictures, logos and icons regarding or relating to Liberty Trails, its products and services, is provided “AS IS” and on an “IS AVAILABLE” basis without any representations or any kind of warranty made to the extent permitted by law, including the implied warranties of satisfactory quality, fitness for a particular purpose, non-infringement, compatibility, security and accuracy. Under no circumstances will Pawfect Dogsense be liable for any loss of data, loss of revenue or anticipated profits, loss of business, loss of opportunity, loss of goodwill or injury to reputation, losses suffered by third parties or any indirect, consequential or exemplary damages arising from the use of this site regardless of the form of action. Liberty Trails does not warrant that service of our content will be uninterrupted or error free or that any content is free of viruses or bugs. The names, images and logos identifying Liberty Trails and their products and services are subject to copyright, design rights and trade marks. Nothing contained in these terms shall be construed as conferring by implication, estoppel or otherwise any licence or right to use any trademark, patent, design right or copyright of Liberty Trails. This site contains links to web sites operated by third parties. Liberty Trails does not have any influence or control over any Third Party Web sites and, unless otherwise stated, is not responsible for and does not endorse any third party web sites or their availability or contents including any views or opinions expressed within these sites. If you have any questions or concerns about our Terms and Conditions of use please contact us at info@pawfectdogsense.com. Pawfect Dogsense CIC (“We”) are committed to protecting and respecting your privacy. This policy (together with our terms & conditions and any other documents referred to on it) sets out the basis on which any personal data we collect from you, or that you provide to us, will be processed by us. Please read the following carefully to understand our views and practices regarding your personal data and how we will treat it. By visiting www.pawfectdogsense.com you are accepting and consenting to the practices described in this policy. Pawfect Dogsense CIC may change this policy from time to time by updating this page. You should check this page from time to time to ensure that you are happy with any changes. For the purpose of the Data Protection Act 1998 (the Act), the data controller is Pawfect Dogsense CIC, 28 Poulton Close, Moseley, Birmingham, B13 9SD. Information you give us. You may give us information about you by filling in forms on www.pawfectdogsense.com (our site) or by corresponding with us by phone, e-mail or otherwise. This includes information you provide when you register to use our site, subscribe to our service, search for a video, watch a video, and when you report a problem with our site. The information you give us may include your name, address, e-mail address and phone number, financial and credit card information, personal description and photograph. Advertisers and advertising networks that require the data to select and serve relevant adverts to you and others. We do not disclose information about identifiable individuals to our advertisers, but we may provide them with aggregate information about our users (for example, we may inform them that 500 men aged under 30 have clicked on their advertisement on any given day). We may make use of the personal data we have collected from you to enable us to comply with our advertisers’ wishes by displaying their advertisement to that target audience. If Pawfect Dogsense CIC or substantially all of its assets are acquired by a third party, in which case personal data held by it about its customers will be one of the transferred assets. Our site may, from time to time, contain links to and from the websites of our partner networks, advertisers and affiliates, or embedded content such as YouTube videos. If you follow a link to any of these websites, please note that these websites have their own privacy policies and that we do not accept any responsibility or liability for these policies. Please check these policies before you submit any personal data to these websites.